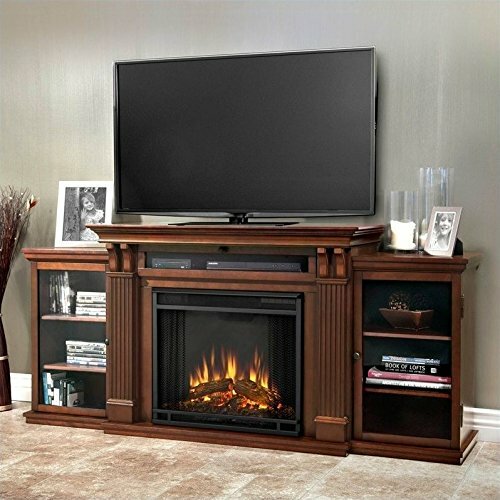 Welcome to our comparison post of 3 large electric fireplace entertainment centers. We compared 3 different electric fireplace TV stands to look at the pros and cons. We used a bit of an old school comparison method. It is very easy to understand – Good, Better and Best. If it made our list it at all the fireplace is note worthy. 3 Different quality manufactures are represented: Southern Enterprises, the furniture maker whose products we categorically recommend. Real Flame, another familiar electric fireplace maker reviewed on this site. And, lastly a newcomer Altra furniture. Their unit easily has the largest number of actual buyer reviews. We hope you enjoy this post and will keep you in suspense until the end to reveal our ‘Best pick. There are many different configurations and finishes available. Click Here to see lots of images and discount prices. Read on to see our top picks. We feel a little awkward rating the Tennyson bookcase electric fireplace as simply ‘good’. It really is better than that. It has elegant classic looks and it is manufactured by Southern Enterprises Incorporated, one of our preferred electric fireplace makers. They consistently produce a furniture quality product. The firebox they use produces above average flame effects and good heat production. This is one of our favorite electric fireplace consoles, but to be perfectly frank it was designed to be a bookcase fireplace. You will have to look at them measurements of the side compartments carefully to make sure that they can hold your DVD player cable box etc. If that works for you this should be a very strong contender. If you’re interested in more info, check out our full review or price by clicking the links below. 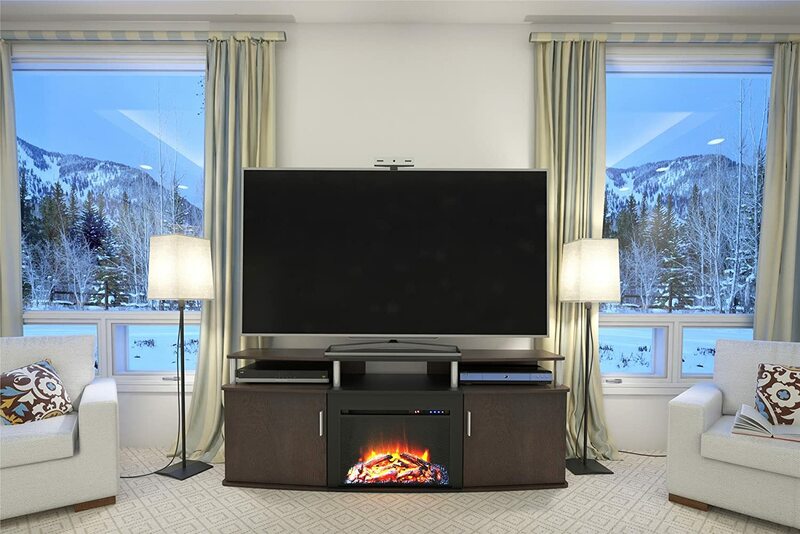 Click Here for Our Complete Review of the Tennyson Entertainment Center Electric Fireplace. This electric fireplace tv stand has been an Amazon bestseller for a long time with very good reason. It provides a really nice, large unit at an excellent price. This is a good looking electric fireplace and entertainment center it has a nice and pretty realistic flame effect. The heating function is standard for fireplaces in this class. This TV stand is built specifically to handle a large TV placed directly on top. 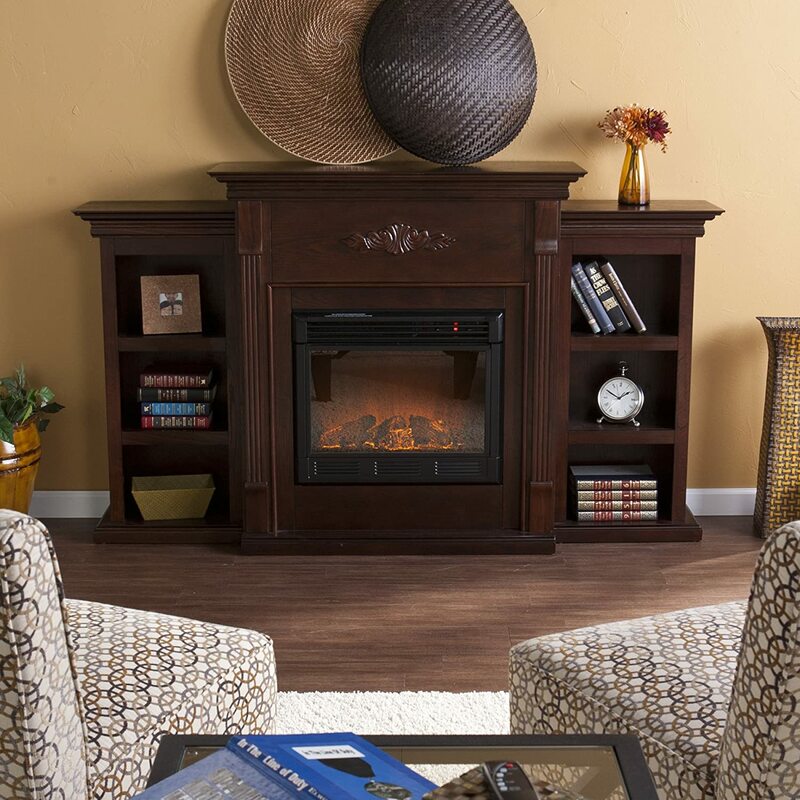 This fireplace is a recommended purchase, especially those looking for a budget friendly electric fireplace. Check out our full review or discounted price by clicking the links below. Click Here for Full Review Of The Altra Electric Fireplace Entertainment Center. Drum-roll please…. Our choice for the best large electric fireplace entertainment center is the Real Flame 7720E Calie Entertainment Unit. You can put roughly a 50″ TV on the center section and have little over hang over the side pieces. This is roughly the size of the TV in the image at the top of the post. That center section is rated to support up to 100 lbs. You can put a TV of up to 70″ on top put would lose storage on top of the wings. Another idea is to mount your TV on the wall. The overall dimensions of this fireplace and media unit are 30.5 inches high by 18 inches deep by 67 inches in width. It weighs 143.5 pounds. The center shelf is 27 inches wide and 12.5 inches deep and the side cabinets are 13.5 inches wide and 12 inches deep. It can support a weight of up to 100 pounds. This electric fireplace entertainment unit is well, and sturdily made. It gives you the convenience of a media center with ample storage combined with the utility of an electric fireplace that will heat your room to standard. This firebox also has exceptional flame effects to create that special ambience, mood, and for you to be cozy by the fire. Click Here for Our Complete Review of the Calie Entertainment Center by Real Flame.